Hanging in the hall of my parents home is an old sepia photograph of my Great grandfather, Guy Gold, and his family. He is smiling proudly across at his youngest son Alistair and it’s an image that fits entirely with my dad’s recollection of a kindly, gentle old fellow who always had plenty of time for children. Recently, when my brother took it out of its frame to scan it he found that written on the back was: Shalford 18 June 1917. Guy Gold’s 40th birthday when home wounded at Battle of Arras. I always knew he had fought in WW1 and that like many of the men who did, he was not a ‘career soldier’ but beyond this I’d never looked into the details of his military service. When I did I discovered that there was a very different side to this smiling family man. For a start the war he was home on leave from was not his first. 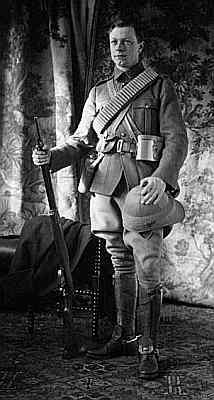 He had already fought in South Africa, 1899 -1902 where his territorial regiment the Essex Yeomanry Cavalry were employed to hunt down and engage mounted Boer Kommandos. This photo (below) shows him on his arrival in South Africa. He was aged twenty two at the time. From what I can tell he settled quietly back into civilian life, married Maude and started raising a family but when World War I broke out the Essex Yeomanry was mobilized and embarked for France to join the 3rd Cavalry Division. In May 1915 they saw action at Frezenberg Ridge, where the regiment made a gallant bayonet charge and succeeded in driving the Germans from trenches which threatened the flank of the 27th Infantry. Five officers and sixty-five men were killed in the attack. The Essex Yeomanry flag, or Guidon, has an impessive number of battle honours including those of Ypres, The Somme, Amiens and Loos but owing to the static nature of the Western Front the EY cavalry fought mainly in a dismounted Infantry role. It was not what they had trained for. That all changed on the morning of 11 April 1917 when they played their part in the battle of Arras. They were tasked with securing the village of Monchy le Preux, a vital piece of high ground which was at this time held by German infantry. To do it they would have to ride across over two miles of exposed farmland laced with barbed wire and enemy trenches whilst under constant fire. This was what they had trained for. The most wonderful sight. It was a thing one could hardly believe to be real. It was a splendid clear open ground over a slight rise where I was standing at 9 a.m. I had passed them (Essex Yeomanry) on my way up and suddenly they passed me at the trot and as they got level they broke into the charge. They thundered past me with their swords and lances all in line. How they got through the fire I don’t know, gaps appeared in their lines and riderless horses were everywhere, but on they went and crashed into the village which they took and held. Monchy le Preux does not have the name and notoriety of other battles but it was the last cavalry charge on the Western Front and Guy Gold, at the head of his squadron, came through it unscathed. But, by the time the EY were relieved two days later 135 of the 600 men who had taken part in the charge were dead, many more were wounded and almost all the regiment’s horses, corralled in the town square, had been killed where they stood by a heavy artillery bombardment during which Guy was himself injured. The order rang out ‘Cavalrymen! Line up on the road.’ And the Yeomen sadly trudged to the rear past the place where the bodies of their horses lay – an image which stayed in the minds of those who took part long after the war had ended. My Great Grandfather was sent home on convalescent leave where the picture, that started this story for me, was taken. But this was not the end of his story. He returned to France the same year and fought at Cambrai and Villiers-Bretonneux, the EY’s last engagement before they were disbanded and broken up among several other cavalry units. After Germany’s surrender he once more returned home to Shalford, and his family. When war broke out again in 1939 Guy Gold immediately presented himself for active duty but this time, despite his protests, he was politely told that his fighting days were over. He was 62. However, the very real threat of invasion was already prompting urgent calls for the formation of some sort of home defence force and amid much confusion the Local Defence Volunteers were raised. They were a regionalised force primarily comprised of men deemed too old for the regular army. Guy Gold was quickly appointed to command his local Brigade. Unfortunately the Government was being very slow to equip the LDV meaning that in the early months they were forced to make do with whatever weapons they could scrounge or improvise, including shotguns, Molotov cocktails and rifles appropriated from museums. Their tactics would have included observing from hedgerows, ringing the church bells to warn of invasion and making barricades of broken farm machinery and furniture. At this time the same German Army, which had already crushed France and Belgium in a matter of days was just the other side of the English Channel , a bare twenty five miles from Britain’s South Coast.I like to think of my Great Grandfather as being able to inspire calmness and resolve in those around him at this difficult time but even he had never faced such appalling odds. He must have known that if this army were to cross the Channel then the Shalford Local Defence Volunteers with their makeshift weapons and ramshackle barricades would have to face the full onslaught of the Nazi Blitzkreig; elite paratroopers, devastating air power and fast moving armour. The invasion never came but as its threat slowly receded my Great Grandfather’s worries did not. By 1942 three of his sons were serving overseas in a war that was far from over and in 1944 came the news that Rodney, my Grandfather, had been killed at the battle of Anzio. I will never forget Armistice Sunday 1944. As the names of the men on the War Memorial in the church were read out and for the first time, that of Rodney, his son, I could not help looking across to him as he stood supported by his walking stick. His facial expression never moved, but for the first time, he did not go the George Inn for a post service drink with the British Legion members, going straight home instead. He belonged to a generation that kept a stiff upper lip and didn’t talk about personal problems but it’s still hard to reconcile the image of the smiling man in the picture I know so well with that of the elite cavalryman whose skill with lance, sabre and small arms must have made him a terrifying enemy. Then there’s the image of the aging veteran with his medals who, even after all the horrific things he’d seen and the comrades he’d lost, stood up to be counted one more time. Most impressive of all was the man who could apparently resume his life in between these events. There’s still a lot I don’t know about him but I’m working on it and one day I hope that myself and my two boys, who are four and five, will visit Monchy le Preux. The Photograph and Text above was provided to this site by Tom Goldwho has shared with us a personal insight about his Great Grandfather which helps us to understand what drove heroes like Major Guy Gold to perform their deeds of derring do.